This labyrinth of power, data and propellant lines is found inside the Mercury Transfer Module, the powerful haulage vehicle tasked with transporting ESA's BepiColombo mission on its 7.5-year journey to the innermost planet. This is the flight model, which will be among the attractions on show at Sunday's ESTEC Open Day. The two wrinkled-looking silver spheres are propellant tanks. The main challenge of flying to Mercury is to slow down enough to fall into the Sun's gravitational pull, the strength of which grows with proximity. The module will use a combination of chemical and electric thrusters to make the trek, interspersed with gravity-assist swingbys of Earth, Venus and Mercury itself. A pair of solar wings, adding up to 33 sq m in total, will generate the power needed to keep the electric thrusters firing. 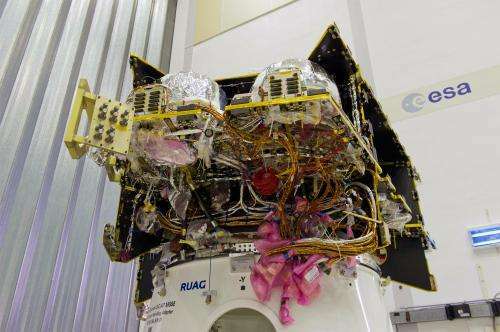 The module will sit at the bottom of the BepiColombo stack, next to ESA's Mercury Planetary Orbiter, which will be attached in turn to JAXA's Mercury Magnetospheric Orbiter. BepiColombo is due to be launched by Ariane 5 from Europe's Spaceport in French Guiana in 2016.